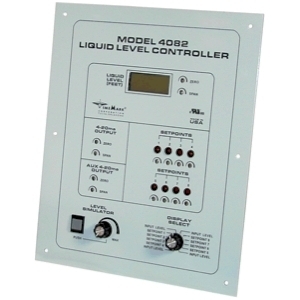 The Model 4082 Liquid Level Controller monitors, displays and controls water level up to 34.6 feet in a tank or reservoir. The Model 4082 operates from the 4-20mA input signal provided by either the Time Mark Model 450 or Model 456-15 Pressure Transducer. This 4-20mA signal represents the water level to be controlled, where 4mA equals zero feet, and the 20mA equals 34.6 feet. A liquid crystal display (LCD) is provided to show the water level during normal operations, and the set-point values during calibration. There are eight user-adjustable trip set-points. As the water level rises above each trip point setting, the front panel LED for that level illuminates, and the corresponding output relay energizes. Two 4-20mA outputs, which track the 4-20mA input, are also provided. These signal outputs can be rescaled to different ranges of level by the user. 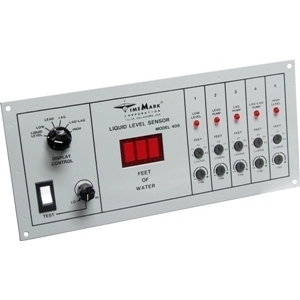 A test control, that simulates an input signal, is available on the front panel. The test control is useful for checking the trip set-points, and overall system operation. 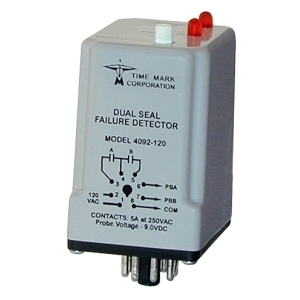 The Model 4092 Dual Seal Failure Detector is designed specifically for monitoring the shaft seals of two submersible pumps. The probes are installed in the seal cavities of each of the pumps. When a seal begins to leak, contaminating fluid enters the seal cavity, lowering the resistance between the probe and the common connection. If the resistance drops below the sensitivity set-point, the corresponding relay and the LED indicator are activated. The Model 4092 will automatically reset when the fault condition is corrected. The sensitivity is field adjustable. 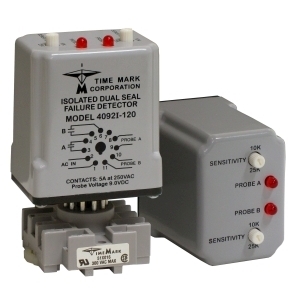 The Model 4092I Isolated Dual Seal Failure Detector is designed specifically for monitoring the shaft seals of two submersible pumps. All electrical inputs are totally isolated from each other. The probes are to be installed in the seal cavities of each of the pumps. The sensitivity is field adjustable. When a seal begins to leak, contaminating fluid enters the seal cavity, lowering the resistance between the probe and the common connection. If the resistance drops below the sensitivity set-point, the corresponding relay and the LED indicator are activated. The Model 4092I will automatically reset when the fault condition is corrected. 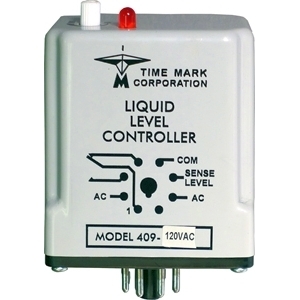 The Model 4093 is a compact, socket mounted Liquid Level Controller that operates by monitoring the conductive liquid resistance between two probes. 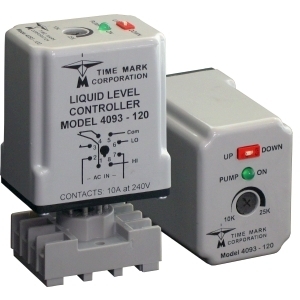 The unit monitors two liquid levels and responds as a pump-up or pump-down control as determined by the switch setting on the top of the unit. The green LED indicates pump operation while the potentiometer allows the user to adjust probe sensitivity. 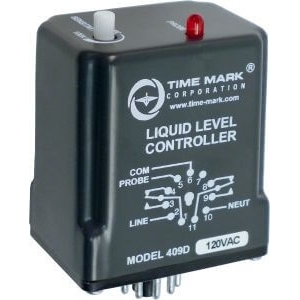 The Model 409D is a compact, socket-mount device for level control of conductive liquids. The internal relay is energized when operating power is applied. When the liquid level reaches the probe, the relay de-energizes. When the level drops below the probe, the relay will reset. A fixed, 300ms time delay prevents oscillation due to wave action. Probe cables may be shielded or unshielded. If the liquid container is made of a non-conductive material, a common electrode is required. Other features include an LED indicator to show the output relay status and an adjustable sensitivity setting. Requires a standard 11-pin octal socket (such as the Time Mark model 51X016).